NOTE: Mormonism has no paid clergy. Lay members are invited to give sermons on Sundays in “Sacrament Meeting.” This “Sacrament Meeting Talk” was written and delivered by Megan Ann Steyskal. [One of the greatest things about speaking in church, as I’m sure you will all agree, is having an undivided audience who cannot leave. It’s why I talk to strangers in elevators= you just simply can’t get away from me. Some of you here know me, you know my background, my story. An even smaller amount of you understand my humor and my quirks. But for those of you who have no idea who I am: simply some strange woman who delights in public speaking and conversing with people who can’t readily escape — for those few I should probably explain myself a little more clearly: I am a Steyskal. I share all of the Steyskal traits: humility, passivity, and debilitating shyness. We are a quiet group and not prone to pomp or embellishment. We come from a rich lineage of meekness and we shall inherit the earth: forthwith. I am the middle child and am prone to bursts of randomness but it always makes sense in the end. I currently work for Providence Medical Group and have been in pharmacy for the last 15 years. Recently I decided that I’m a writer and have been spending my free time writing for anybody that will let me — currently a couple of websites and my own personal blog. I was asked to reflect on gratitude today, but I wanted to dive a little deeper and focus on gratitude as it pertains to our own personal relationship with Jesus Christ. There is a particular moment from girls’ camp that I go back to every once in awhile. A small group of us had taken our free time to venture out into the forest, and after finding the perfect spot to take in the natural beauty and summer sunshine, we began to speculate on our own contributions to the creation of this beautiful world. “What flowers do you think you made?” one of the girls asked me. I had never thought about it before, it almost seemed blasphemous to assume I had anything to do with the creation — that was all on God, surely I had no say in the matter. But what if I did? What if we all did? At that ah-ha moment my imagination ran rampant. I like to think that I was personally responsible for the Venus Fly Trap, if anything to add a little macabre to the mix of pink tulips, romantic roses and happy sunflowers that the other girls were bragging about. There have been many times since then that I have meditated further on that idea: that there I was in pre-mortality: sitting next to my Brother (Jesus Christ) talking quietly about flowers. He explaining the concept and me doing my best to appreciate His vision, the world He would create for me. Why wouldn’t it have happened like that? Is it too much to theorize that we each had a personal relationship with our Savior in pre-mortality? That we had our own individual time with Him where we would converse and share our feelings? Time spent of Him learning about and delighting in my personality, my ever evolving character, and seeing my many strengths and weakness unfold, He saw in me the person I was meant to become and He encouraged me to always turn to my Heavenly Father for guidance. We spoke face to face. He explained His plan to me and why it was important that I chose for myself. There was no mass conference meeting with a Power Point presentation of the Plan of Salvation. I was taught the plan from Him personally, and He asked me how I felt about it. I know how I felt: simply by being here I know I chose to follow Him. I was there, I made my voice heard, and I chose to follow Jesus. He was never a figure in the crowd; a celebrity out of reach that would walk by: with me fighting amongst raging teenage fan-girls trying to get a selfie with Him. He wasn’t someone I heard of, He was someone I knew. And He knew me. I feel very strongly that right before I came to Earth, He asked me how I felt about the upcoming departure: was I excited? Was I scared? Was I anxious? Then He comforted me: telling me that because He knew me, He chose the perfect Earthly companions for me: that I would need strong, courageous and loyal brothers…a lot of them. He gave me sweet yet feisty sisters who understand me. Because He knew me, He knew who my parents should be. And because He loved me, He chose for me the friends and extended family that I needed the most and who needed me as well: quirks and all. Haven’t you ever wondered about that? How you came to know Him, to trust Him, to love Him enough to choose Him? But most importantly, have you ever wondered how you can know Him now? Being veiled from the Heavenly plane was never the end of our relationship with Jesus, it was simply another step. I can’t recall the moment when He told me that by choosing His plan I would not remember Him. But I can only assume that it was said with love and received with hope. So here we are, journeying through, and we have an opportunity to know Him again. To rebuild our personal relationship with our Brother, our Savior: Jesus Christ. If He was to enter through those chapel doors right now, how many of us would recognize Him? Our earthly senses will not be able to help us: the pictures depicting Christ are only just that — depictions. We need to have an instinctive pull so secure that we feel His presence before we can even see Him. About five years ago after my divorce I had moved out into my own apartment. After talking with my sisters-in-law, I explained that if I came home too late there are often no places for me to park, making me have to park two blocks away on the main street next to the railroad tracks. My sisters, to say the least, were concerned for my safety, and that night after our family dinner I was told to text them as soon as I got home so they knew I made it inside safely. By the time I got home I had completely forgotten, as I was more concerned with my cell phone battery being dead: I connected the charger and went about my nightly routine to get ready for bed. An hour later I had a knock at the door and instinctively knew both of my brothers were there. I ran to the door and saw them not exactly looking thrilled to be there. Brad was the first to speak, saying that I had received several texts from his concerned wife and had failed to respond to any of them. “Oh, my battery was dead,” I explained. “You don’t say? Allison told me she was worried about you and that she wasn’t going to get any sleep until she knew you were safe; which meant that I wasn’t going to get any sleep until she knew you were safe,” Brad said. My brothers came in and gave a blessing for my apartment to keep me and my son safe and secure. There have been many knocks on my door since then, and I have always known when my brothers were on the other side. Our spiritual connection needs to be so strong that when Christ knocks we instinctively know it is Him and are willing to let Him in. For the past several years I have heard Him knocking but couldn’t answer. My guilt, grief and shame kept me from facing my Savior. The paradox: that no unclean thing can live with Him and here I was a flawed human. I just couldn’t answer. It wasn’t until I allowed the Atonement into my life that I was able to open the door. The Atonement acting as the door handle that enables us to open our hearts to Christ. How we can learn about him through scripture both past and present: from the Prophets and Apostles called as special witnesses. How we can serve others in His name. How we can develop gratitude from understanding and utilizing the Atonement. Firstly: scripture study of the Bible, Book of Mormon, Doctrine and Covenants, Pearl of Great Price are also to be studied along with teachings from Latter-day Prophets. “Ponderizing” the scriptures became a social media craze brought on by Brother Devin Durrant (at the October 2015 general Conference) who challenged us to memorize and ponder a scripture each week. The idea is simple, yet can have everlasting effects, as we take to the scriptures to better understand who we are and where we came from. Sincere prayer before reading can open our minds and spirit to hear the messages Christ has for us. 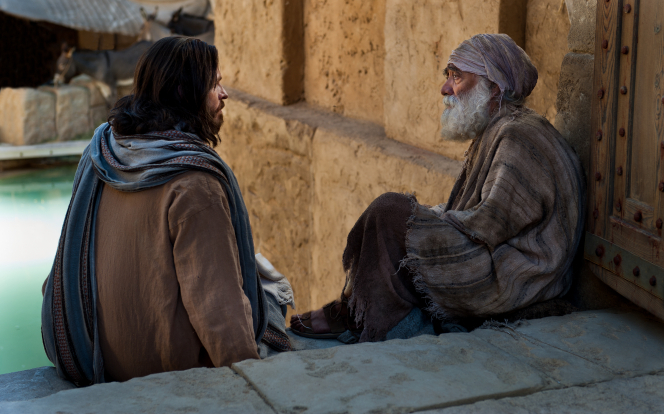 We have prophets witnessing to each of us of Christ’s love and sacrifice. They are spiritually guided, and Heavenly Father continues to reveal to them what we need to hear, what is relevant to us in these times. By pondering the words of these prophets we can obtain wisdom of who Jesus is and why He would sacrifice His life for us. Because He suffered every manner of affliction on Earth, He truly does understand. And this is what I hinted to at the beginning, when I spoke of Christ knowing us. As He knelt before His Father in Gethsemane He saw each of us: He knew me, and because of this, He suffered for the guilt, the grief, the sorrow and the pain He knew I would face. It was so much more than sin, He took upon Himself all of my hardships. With my name spoken He felt the humiliation I would feel, the mental, emotional and physical torments each of us goes through. He had no debt to pay. He committed no wrong, yet there He bled, willingly: for me, for all of us. Brothers and sisters, I testify that to fully appreciate the many depths of the Atonement we need to first understand why He would suffer for us. And that is something you each need to answer for yourself. An authentic relationship with our Savior is a sweet and sacred desire. Through this journey reflect on your life: the moments that bring you joy, the faith that brings you comfort and the Savior that brings us all hope.